For years now, I have used Dragon NaturallySpeaking as my go-to tool to save my wrist and help me be more efficient in creating content for my writing clients. But using Dragon with Google Docs has always been difficult. 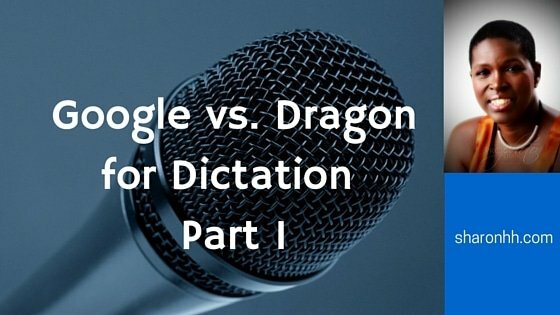 I’ve never found the Dragon browser plugin particularly effective in helping me to create content and using the dictation box has not always worked either. So I’ve often had to use workarounds (involving a lot of cutting and pasting) when dictating to a Google doc. So I was absolutely delighted when the desktop version of Google Docs got the ability to let me dictate directly using Google Voice Typing. It’s been on mobile devices for a while, but since I’m usually at my desk, the desktop option is better for me. I spent a week testing it out and was pretty impressed. To start it up, you simply go to the Tools menu within your Google Doc and enable voice typing. It brings up a large microphone which turns red with a circle around it when you are dictating and it is in the process of recognizing what you say. If you’re used to using Dragon, you will find the commands limited, as Dragon is pretty rich in this area. You can easily indicate a few basic punctuation marks such as commas, new paragraphs and new lines but in my limited test Dragon is much better at discerning your intention with punctuation. However Google Voice Typing, as I’ve mentioned before, is great at understanding the context of your sentences. It is also extremely fast so there’s no waiting around while it recognizes and changes sentences. Would I use Google Voice Typing to replace Dragon? Probably not in every case but certainly when I want to dictate into a Google Doc, which I do at least a few times per week. For me, it means I have two dictation tools available instead of just one and, as far as I’m concerned, that’s a very good thing. Just so you know, I dictated this post with Google Voice Typing, then edited it later in Scrivener. For my next review, I’ll look at Dragon Professional, which is the latest version of Dragon Naturally Speaking. Update: Part 2 is now live. Neat idea for a post. I just got a new Nexus phone last week, and compared to the Samsung Galaxy I had before, I must say — this new phone’s ability to capture my speech is significantly better. I don’t know if that’s the result of software upgrades, or simply a better mic in this phone. But if Google Voice Typing is at all similar, I should probably give it a try. And by the way — sorry. I know it’s been a little while since I’ve stopped by your blog. Hey Brent, nice to see you here. No worries about not stopping by; there hasn’t been much new here. Sharon, a nice blog and writing style as this is my first time visiting your website. I am a Chromebook user and use Google Docs where now we have an option to use Google Voice to write. I am going to give it a try now that I have read your article. I think it can be a game changer for may writers and bloggers if people can get used to write by talking. Thanks for your feedback and sharing your personal experience.